A new rendering of Huygens descent and touchdown created using real data recorded by the probe’s instruments as it descended to the surface of Titan, Saturn’s largest moon, on 14 January 2005. The animation takes into account Titan’s atmospheric conditions, including the Sun and wind direction, the behaviour of the parachute (with some artistic interpretation only on the movement of the ropes after touchdown), and the dynamics of the landing itself. Even the stones immediately facing Huygens were rendered to match the photograph of the landing site returned from the probe, which is revealed at the end of the animation. Split into four sequences, the animation first shows a wide-angle view of the descent and landing followed by two close-ups of the touchdown from different angles, and finally a simulated view from Huygens itself — the true Huygens experience. This animation was released on the eighth anniversary of Huygen’s touchdown on Titan as a Space Science Image of the Week feature. 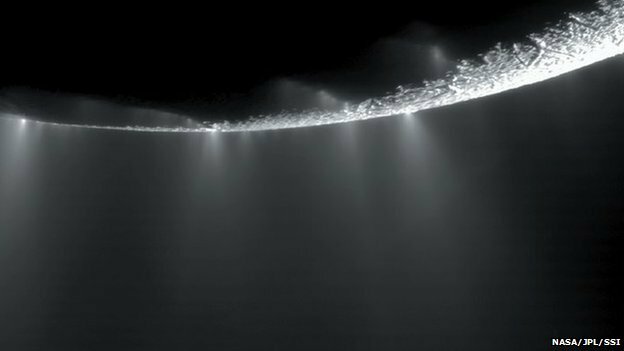 The water geysers of Enceladus spew the most material when the small moon ventures farthest from Saturn, planetary scientists in the US have found. This discovery confirms a prediction of a theory that says the geysers’ strength depends on Saturn’s tide. Discovered by the German-born English astronomer William Herschel in 1789, eight years after he spotted the planet Uranus, Enceladus is the sixth largest of Saturn’s 62 known satellites. The small moon is 238,000 km from Saturn’s centre, about two-thirds of the distance from the Earth to the Moon. Because Saturn is so massive, though, its gravity forces Enceladus to circle it every 1.37 days. With a diameter of just 500 km, Enceladus is only one-seventh the size of the Earth’s Moon and it lacks the radioactive elements that heat the Earth’s core. This makes it an unlikely world for geysers or any other geological activity. In 1980 and 1981 NASA’s Voyager 1 and 2 spacecraft flew past the ringed planet and found Enceladus’s surface unusually smooth. This suggested that something was erasing its craters. Then in 2005 the Cassini spacecraft discovered water vapour around Enceladus. Cassini soon found the surprising source: geysers around the moon’s south pole shoot water vapour and ice particles hundreds of kilometres above the surface. Some of this material settles on the surface of the moon, covering its craters. Now planetary scientist Matthew Hedman of Cornell University and his colleagues have examined 252 near-infrared images from Cassini. “The brightness of the plume varied quite a bit,” says Hedman, who found it four times brighter when Enceladus is farthest from Saturn than when closest. These observations agree with a prediction made in a paper published in 2007 by Terry Hurford of the Goddard Space Science Center in Maryland, who had calculated how Enceladus would respond to Saturn’s tide. Tides arise when gravity pulls on an extended object. For example, lunar gravity tugs strongest on the side of the Earth facing the Moon, lifting the sea. Likewise, on the opposite side of the Earth, the Moon’s gravity pulls our planet’s centre out from under the sea, producing a high tide on the far side as well. Elsewhere, tides from Jupiter power the fiery moon Io, which sports active volcanoes, and melt ice beneath the surface of the moon Europa…. The last time Cassini had such an unusual perspective on Saturn and its rings, at sufficient distance and with sufficient time to make a full system mosaic, occurred in September 2006, when it captured a mosaic, processed to look like natural color, entitled “In Saturn’s Shadow.” In that mosaic, planet Earth put in a special appearance, making “In Saturn’s Shadow” one of the most popular Cassini images to date. Tethys may not be tiny by normal standards, but when it is captured alongside Saturn, it can’t help but seem pretty small. Even Saturn’s rings appear to dwarf Tethys (660 miles, or 1,062 kilometers across), which is in the upper left of the image, although scientists believe the moon to be many times more massive than the entire ring system combined. This view looks toward the unilluminated side of the rings from about 18 degrees below the ringplane. The image was taken in green light with the Cassini spacecraft wide-angle camera on Aug. 19, 2012. 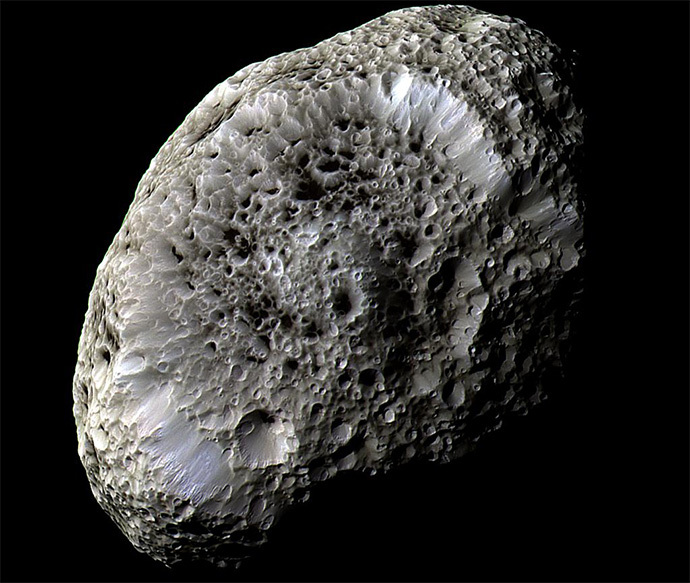 The view was acquired at a distance of approximately 1.5 million miles (2.4 million kilometers) from Saturn and at a Sun-Saturn-spacecraft, or phase, angle of 63 degrees. Image scale is 86 miles (138 kilometers) per pixel.